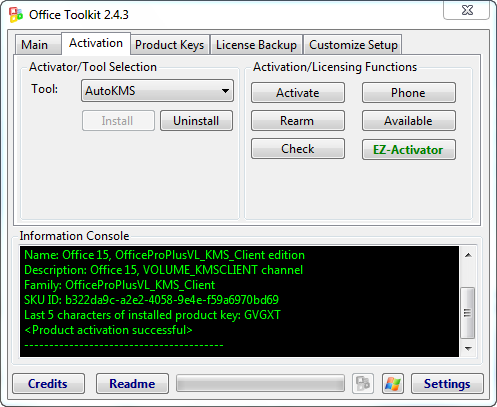 Microsoft Toolkit - this is the next stage of the activator of the Office 2010 Toolkit CODYQX4 & Bosh. Includes a set of tools for managing licenses and activation. You can also put on some activation is one component of the office, only Word or Excel. Works with all versions of Office 2010. It can use the KMS-activated, even if you are using a retail Retail license. In addition to the options on the activation of different versions of MS Office, CODYQX4 added various options to activate Windows 7, so we have a common activator for modern products Microsoft. At the time of the alpha release is completely stable. 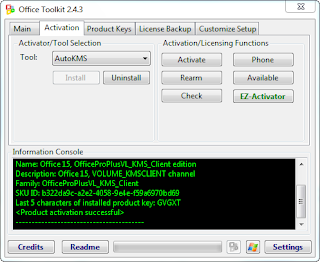 This is a set of tools for managing licenses and activation of Office 2010. The result of all the functions displayed in the information in the console window. All operations are performed in the background, and a graphical interface is disabled to prevent multiple execution functions, since this could lead to instability or damage to the Office 2010. Functions AutoKMS Uninstaller, AutoRearm Uninstaller, Office Uninstaller and Product Key Checker work even if Office 2010 is not installed. PROTIP: Use win8kms.mooo.com as KMS Server to activate Windows 8. -Currently using OTK changelog / Readme.